THE renaissance of Birkenhead is picking up pace with the imminent transformation of a dilapidated former office block into high-quality student accommodation. Developer YPG, which is based in Liverpool, has submitted an application to convert the former Wirral Council building on the corner of Cleveland Street and Adelphi Street, just a stone’s throw from Hamilton Square. Subject to consent, the new apartment complex will become home to some 200 students and include a secret garden and rooftop extension, as well as communal facilities for the residents. The development would provide accommodation for those studying at a new Marine Education and Training Centre being developed in Wirral as part of the new Mersey Maritime Knowledge Hub. The application for the Cleveland Street site, which will be called the Hamilton Hub, will be considered by planners in coming weeks. 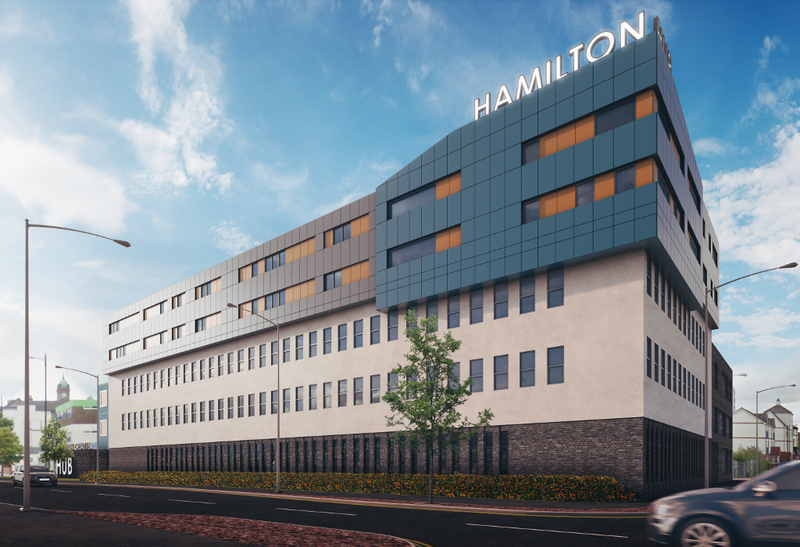 The Hamilton Hub would have facilities including a gym, communal areas and a laundry. A roof top extension would be added to the existing building, taking it from two and three storeys to between three and five storeys. The secret garden would be in the centre of the building, which would offer a total of 4,450 square meters of space. Subject to consent, work on the site would start early next year. YPG is a specialist mixed use regeneration and property company that currently has some £180m of developments in its pipeline. Ming Yeung, Managing Director of YPG, said: “Our research tells us there is a real appetite for this kind of student and key worker accommodation in the centre of Birkenhead, partly because of the city region’s excellent cross-river transport links. The Marine Education and Training Centre is designed to develop world-leading specialist education and training programmes, drawing upon the research strengths of the university and close relationships with the maritime industries. The centre will be supported by a commercial offshore training centre and a marine and engineering simulation training centre. Phil Davies continued: “We’re delighted to see developers bringing forward schemes that complement our strategic plans to develop a globally significant Maritime Knowledge Hub. “The Hub will bring together research and industry partners to foster innovation which help drive sector growth in the City region.